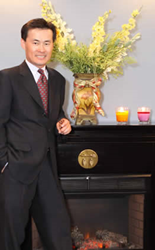 Dr. Jin Y. Kim, a world-renowned, board-certified periodontist, is focusing his practice on helping patients with missing teeth in Chino Hills, CA, revitalize their smiles and oral functionality with permanent, expertly placed dental implants. Using 3D imaging and implant planning software, he considers nerve location, bone density, final aesthetics and long-term functionality in order to precisely map out the ideal location for the implant post. Board-certified periodontist Dr. Jin Y. Kim, a world-renowned dental practitioner with Diamond Bar and West Garden Grove locations, is welcoming those with missing teeth in Chino Hills, CA to learn more about dental implants, with or without a referral. Skilled in computer-guided implant placement, Dr. Kim uses the latest technology to provide a permanent solution for those who want to replace lost or extracted teeth while improving their oral function and overall appearance. The American College of Prosthodontics estimates that 120 million men and women are missing at least one natural, adult tooth. Although it is possible to continue living day-to-day without a tooth, it can be troublesome and embarrassing. Depending upon the location of the missing tooth, the patient may have difficulty speaking and due to restrictions in their oral functions a limited diet. Dental implants are a long-term solution that works for many of Dr. Kim’s patients. Using 3D imaging and implant planning software, he considers nerve location, bone density, final aesthetics and long-term functionality in order to precisely map out the ideal location for the implant post. By leveraging the latest tools and technologies, he not only increases the likelihood of a dental implant’s long-term success, but he assists patients in reaching their aesthetic and wellness goals as well. Because of Dr. Kim’s status as a recognized medical leader, he frequently speaks around the nation, as well as internationally, to educate clinicians on the latest periodontal and implant dentistry advancements including most recently, at the Global Dental Implant Academy USA Symposium. Further shaping implant dentistry, Dr. Kim is a consultant for numerous companies that produce dental implants and a consultant for a major United States surgical device manufacturer. Anyone with single or multiple missing teeth in Chino Hills, CA, are encouraged to contact Dr. Kim’s offices in Diamond Bar, CA, at 909-860-9222 and Garden Grove, CA, at 714-898-8757, to set up a no-obligation examination to discuss dental implants.